Make your application upgradable over the internet with this easy tool Make your application upgradable over the internet with this easy tool. Automatic upgrages minimize the chance for a user error. Download the free trial and setup in 1 hour your automatic software updates. 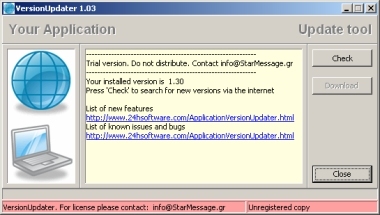 Examples of update scripts included. You will only need to change your URL information. Moon phase calendar screensaver lets you write your name in the stars. Make your application upgradable over the internet with this easy tool. An excellent way to keep a private diary of day to day thoughts, and memories..
StarReminder - Reminder software for windows.